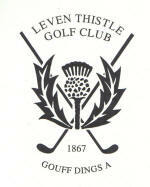 Welcome to Leven Thistle Golf Club's web site. Founded in 1867, Leven Thistle is famous throughout Scotland both for the quality of the golfers it has produced and the warm welcome that is extended to visiting golfers. Our clubhouse was built in 1899 and in recent years has been extensively renovated to allow members and visitors alike to enjoy the sort of facilities expected from a golf club in the 21st century. We hope you enjoy browsing through our web site and if you are visiting Leven you will be made most welcome in Leven Thistle.